Alter of St. Bartholomew Catholic Church. The parish of St. Bartholomew's Catholic Church in Villard celebrated its 125 years in 2008. The following is a brief history of the church from 1883 to 2008. Catholic missionaries ?rst visited the Villard area in 1866. The group was led by Rev. Augustine Burns, a missonary for Pope County and other counties in the area. About 17 years later, in 1883, the Rev. C. V Camache organized the Villard Catholic Parish. A church was built under his supervision and was known as "Church of the Lady of the Lake." The church was located two blocks west of the present grocery store on Main Street and north of the street that led to the lake. Father Camache lived in Sauk Centre and came to Villard for worship services. 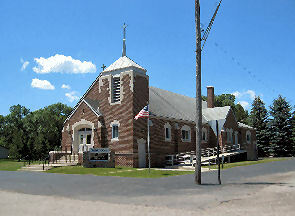 The actual church building was constructed by John Gaffaney, Frank Burns, Patrick Malloy, Daniel Daugherty, Frank Daugherty, Edward Wansley, Patrick Hogan, John Hanrahan Sr., John Heffers, James Hart, Stephen Hart, Hubert Lenz, Peter Smith, Dan Kane, Henry Kane, Thomas Gallagher, Joseph Blomigan and Lawrence Cosgrove. Early residents instrumental in building the church are memorialized on the tombstones in Calvary Cemetery, located south of Villard. In 1903, a belfry and sacristy were added to the original church building. In 1883, the church purchased land for its cemetery ($75), had the new land surveyed ($12), recorded the deed (75¢) and fenced the area around the cemetery ($7.75). A home was also purchased and furnished for the priest in the same year. The Rev. J. Brender lived in Villard for only a short time (1893-1894) but it was during Brender's pastorate that the name of the church was changed from "Church of the Lady of the Lake" to "St. Bartholomew." In 1923, under the leadership of Rev. Benedict Petermeier, property was purchased in Villard where the present building now stands. The property was 175 feet by 150 feet and was purchased by the church for $175 plus one year's taxes. Shortly after the purchase of the land, the basement church was built in 1923 by George Hallet, of Glenwood at a cost of $4,700. At the time, membership had reached 130 people. Seating capacity for the basement church was about 225 people. By 1935, the Fnancial squeeze from the Depression started to loosen its grip, as noted in church records.The superstructure of the present church was built in 1950 under the direction of Rev. Harold Dimmerling. It was built on top of the basement church, at a cost of $42,000 to $46,000. The ?rst mass in the new church was held on midnight on Christmas in 1950. A dedication service held in 1951 was attended by the Most Rev. Peter Bartholome, Bishop of St. Cloud, along with 40 priests. The outside of the church has been ?xed up several times over the years. The two biggest additions to the exterior since it was built are the monument erected in the front of the church in 1976 and the handicap accessibility ramp constructed in 1998. The monument was donated by the Clarence Reichmann family in memory of their son, Dr. Theodore Reichmann, who was killed in a car accident on Aug. 17, 1973, on his way home from a service call. More renovations are currently underway at the church. These improvements include new hardwood ?oors and carpet on the interior and a new roof and maintenance free trim on the exterior. The church council is also exploring the idea of making the entire church handicap accessible. During the dedication of the 1951, the Most Rev. Peter Bartholome, Bishop of St. Cloud promised the parish would be assigned a resident pastor as soon as the debt was retired and funds for the parish house were on hand. The parishioners retired the debt in mid 1960s, but due to a shortage of clergy, this promise has not been ful?lled. For the ?rst 23 years (1883-1907) the Villard parish was served by priests from Sauk Centre. For the next 66 years (1907-1973) the priests from Glenwood took care of the spiritual needs of the parish. Since 1973 the Villard parish has been twinned with the St. Alexius parish in West Union.